Tambrauw is a regency between Sorong and Manokwari. Most of its territory consists of mountains, and valleys with pristine tropical rainforest covers most of the land. Very few people know that Tambrauw is a great site for nature tourism. 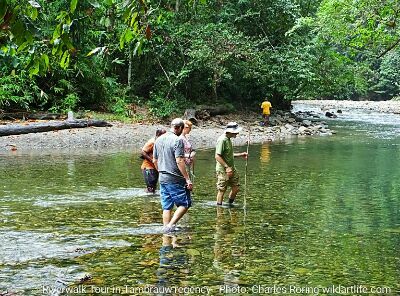 The coastal area in the north of Tambrauw have got rivers that tourists can explore to see the wealth of tropical avifauna of New Guinea. I have organized numerous hiking, camping, and birding tours to the coastal and mountaineous regions of Tambrauw regency for visitors who came from the Belgium, United States, France, Germany, Luxembourg, Czech, the Netherlands, and Poland. They spent between 4 days to 1 week in the forest and at the beach of the regency. I personally have visited the interior region, beach area and rivers of Tambrauw to do birding and wildlife watching. The first time I went there was when I guided two Belgian tourists. We watched Sulphur Crested Cockatoo, Pinon Imperial Pigeon, Pink-spotted Fruit Dove, Black Fantail, Blyth's Hornbill, Yellow-faced Myna, Palm Cockatoo, and Lesser Birds of Paradise. 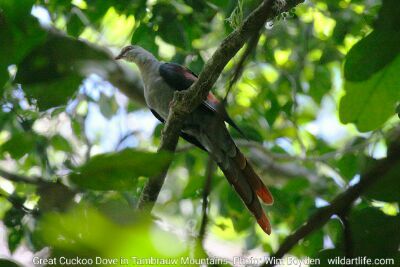 Tambrauw Mountains are located in the bird's head or Vogelkop region of West Papua. It is a great destination for tourists who like birdwatching. There are a lot of birding sites in Tambrauw but the place that can easily be reached by bird watchers is Syugrar river. To visit that place, tourists need to fly from their country to Jakarta - the capital of Indonesia. After that, they can continue their trip by taking a domestic flight to Sorong city. I could meet them at the airport and organize the transfer by car or by plane to Tambrauw. Birds that can be seen in this forest are the ones that live in lowland and lower montane forest. Bringing a good pair of binoculars, spotting scope and field guide book: Birds of New Guinea written by Thane K. Pratt and Bruce Beehler will enhance the birding experience of every bird watchers. Because there is no guesthouse in the forest, we can build tents at the bank of the river and enjoy hiking, swimming, birding, and wildlife watching. From my previous trips, I saw various species tropical birds such as Lesser Birds of Paradise, Magnificent Riflebird, King Bird of Paradise, Palm Cockatoo, Yellow-faced Myna, Pinon Imperial Pigeon, Grey Crow, Black-capped Lory, Little Egret, Rainbow Lorikeet, Torrent Flycatcher, and Golden Myna.